Your doggie looking for a girly girl dining bowl? 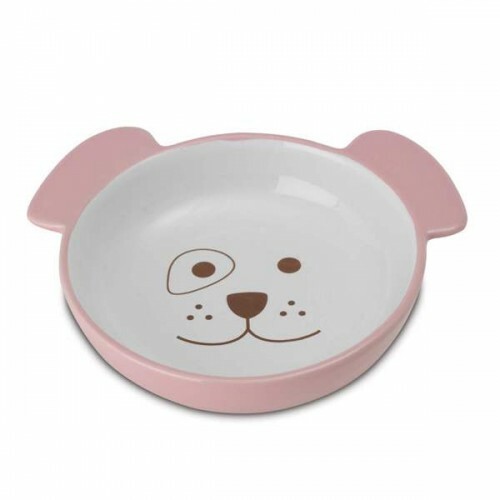 PetHangout is happy to offer this Pink Dog Bowl as part of our Feeding Collection. We think this bowl is precious for the dainty little girl doggie. She may just think she is looking in the mirror when she sees the cute puppy face inside the bowl. It is made of oven-fired ceramic and is hand painted. These bowls are tough and designed to last for years to come! Width: 5.5 inches and shallow height. PetHangout also offers other cute dog bowls: Check out the black and white halo dog dish and white and turquoise bone bowl. Questions...? send us a quick message or call 877-860-1278. We will bend over backwards to find your answers! Your dog will love the dog bone designs on this hand painted bowl! PetHangout is happy to offer this Dog Bones Bowl as part of our Feeding Collection. We think this bowl is ultra fun and fun to look at. The hand painted bowl is oven-fired to resist fading and chipping. A must have addition to any doggie corner of the room! Complements any corner of the room. We recommend pairing with a turquoise mat for ultimate fashion sense. PetHangout also offers other cool dog bowls: Check out the black and white halo dog dish and pink puppy face bowl. Questions...? send us a quick message or call 877-860-1278. We always want to help!